FRESH 12oz glass bottles Dr. Enuf Original Energy Booster with SUGAR!!! No HFCS in this Johnson City, TN classic!!! Dr. Enuf has been providing a great tasting boost of energy since 1949 by providing refreshing soft drinks enriched with vitamins and minerals. Each bottle contains carbonated water, 100% pure cane sugar, citric acid, natural and imitation flavors, potassium benzoate, caffeine, niacin (B3), thiamine (B1) and potassium iodide. Dr. Enuf was one of the first -- if not THE first -- energy drinks to hit the market. It's been around since 1949 and since then it has been packed with vitamins. Not to mention that it tastes awesome. The clean crisp flavor is a very mild citrus-like flavor that has a slight bite to its finish. Dr. Enuf is a true classic in both flavor, packaging, and ingredients. We absolutely love it. 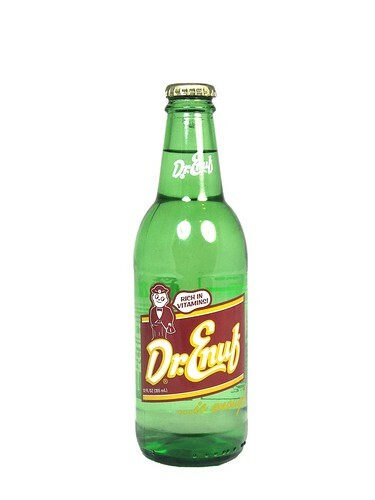 The aroma of Dr. Enuf will remind you of Sprite or 7-UP. Just about every energy drink on the market today overwhelms the body on many different levels. But not Dr. Enuf! The light carbonation and slight flavor taste of Sprite or 7-Up are right on target. In our opinion, it just doesn't get much better than this!